Around the world a deep breath is being drawn by those who have been following the saga of the investigation of the Koh Tao murders last September. 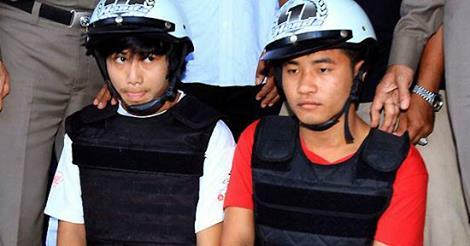 Since the deaths of Hannah Witheridge and David Miller and the subsequent arrests of Wei Phyo and Zaw Lin social media sites have continually buzzed with accusations, the ramblings of couch detectives and endless questions regarding the way the investigation was conducted and of course the pleas of innocence from those who stand accused. Wei Phyo and Zaw Lin initially pleaded guilty to the crimes, but later withdrew their confession claiming they had been forced into saying they were responsible. While it is of course natural for the mass public to be interested in such high profile cases one hopes that the press will act responsibly during the trial and remember that relatives of the deceased may be among those present. While they are going through a nightmare that is simply unimaginable to most parents, some level of decorum is required to preserve their and their children’s dignity. High profile cases such as this are bound to attract the ‘ever-interested’ press, and of course there is no doubt such cases need to be covered, however one can only hope that actual facts are presented by the press, rather than the embellished versions of ‘honest reporting’ that have been seen in some of the bigger UK newspapers. While the dignity of the grieving families needs to be considered, so too must it be remembered that the families of the accused are also going through their own personal living hells. Guilty or innocent it is likely that nothing could prepare the mothers of the accused for a high profile murder case when they are used to living a very simple life in rather impoverished villages in Myanmar. It is also important that those involved in the case act responsibly, and are guarded in what they say to the press and refrain from sensationalism. Using the press as a way of garnering publicity for other cases or raising one’s own profile could be highly damaging to what is already a very sensitive case. It is vital that words are not put into the mouth of the accused not in a position to speak for themselves. Pointing fingers at other members of the community not standing trial is also deeply irresponsible. And of course it is also of the utmost importance that those attending the trial do so with decorum and dignity. While many accusations have been made with regards to the wrong men standing trial it is important to remember that no matter what one’s own personal opinions are, the court is a court – where respect and good manners should be expected. Respecting those in authority, dressing appropriately, abiding by court protocol and never using dubious means to gain access to the court are all vital factors in ensuring this high profile trial is not turned into a high profile media circus that will damage all those concerned.